Anil Tyagi is the founder and MD of Nuberg Engineering, India's leading engineering, procurement, construction (EPC) and project Management Company with specialization in chemical process plants. With over 3 decades of rich experience spanning EPC projects, Anil is a name to reckon with in the chemical/EPC industry. Anil's pioneering work and engineering depth have helped Nuberg to innovate and develop in house technology for Chlor Alkali, Sulphuric Acid and Hydrogen Peroxide Plants. A mechanical engineer by profession, Anil with his far-sighted vision and keen business acumen founded Nuberg in 1996, after 10 years of experience in the private sector. He has contributed the necessary leadership and impetus to the group and with a clearly defined objective of bringing the best in the industry he has transformed Nuberg into an world class organization operating in more than 30 countries. Backed by a strength of 300 engineers, state of the art manufacturing facility in Gujarat and Noida and research centre in Sweden, Nuberg provides EPC services to Chemical & Fertilizers, Hydrocarbons, Steel and Nuclear & Defence sectors. VK Gupta is the co-founder and MD of India’s leading engineering, procurement, construction (EPC) and project management Company. 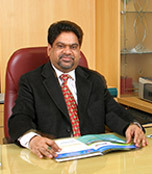 VK Gupta has been instrumental in defining the company’s technology and product strategy focusing in Gas Plants. He is credited for developing breakthrough solutions in the gas division of the company and the industry.